I tended to make my early versions into notebooks full (or mostly full) of little tidbits. My earlier notebooks were mostly quotes that I liked, books I wanted to read or that others recommended to me, the occasional movie title and description, and so on. I have found that I keep different types or combinations of things in my commonplace books, depending on how my life is going at the moment or what is going on in my life. When I have tough times, I tend to include humorous stories, funny cartoons, jokes, upbeat and inspirational quotes and websites that I find helpful. I also have noticed my mood changes or shifts by the books that I note in my commonplace book. I think commonplace books offer a different way to note and track changes in our lives. I have also kept these at work as well, with the topics mirroring work I was doing, concerns I had, or things I needed to remember or to do. Of course, with work documents, caution is advised; proprietary information must be protected. Always, always, always follow corporate policy with regard to company information. (I am definitely not advocating information theft!) Someone following behind me may have found my tips and ideas helpful – or they may have just shredded them. What can a commonplace book be used for? Well, practically anything. It can be a useful note-taking tool while writing a book; you can keep research notes, books to use, character name ideas, location descriptions and more. It can be useful in defining an idea – keeping all of the details flowing but allowing you to notate everything in one location. It can be used to create a reference of inspirational quotes that you found useful – quotes specifically helpful to YOU, not necessarily everyone else. It can be used to help organize your thoughts, your day, your studies. A combination of quotes and commentary on books read can be helpful as well. The ideas for usage are limitless – well, perhaps limited only by imagination! I am thinking of keeping one for my blogs; I think it would be helpful to keep research notes, topic ideas, scheduling, and more all in one place. Of course, I might also make that one section of a commonplace book. Reinforcing learning – many people remember things better if they write things down. Increased creativity – it can help us see patterns in various pieces of information, and help us create or discover connections. Filter information – a commonplace book can help you filter the overwhelming amount of information that bombards us daily. This is a place to record only what is significant or seems significant. Whether you keep an electronic or a paperback version depends on what your goals are, what your preferences are, and perhaps which one is more frequently available to you. An electronic version may allow you to include kinds of media such as videos, music, and images. It can also be accessed from anywhere with internet access if you keep it online. On the other hand, in a power outage, you lose access. In addition, a paper version requires personal writing, which can aid memory. Electronic or paper? Choose your medium. Weigh the benefits of both and chose the best one for your circumstances and preferences. Blogs can be used for this, as can Pinterest and other similar sites, at least to some extent. I have also seen suggestions for Evernote, Tumnblr, and OnSwipe, among others. Frankly, I prefer pen and paper. For me, actually physically writing something out helps me remember things better than typing them out. In addition, I can doodle, draw, and sketch to my heart’s delight. Others find electronic versions more appropriate or desirable. Some of the benefits of keeping it electronically are portability, ability to combine pictures, calendars, notes, and more; in addition, electronic versions are more readily divided into sections, arranged and re-arranged. Another thing to consider is organization. If you don’t organize your book in some way, you will struggle to find any information when you want it. One idea is a section for list of books to read, another for quotes from the book, and interpretations and other material. Ways to create sections depend on the medium you are using; there are tabs (permanent and sticky-note type) that you can add to blank books, you can use tabs in 3-ring notebooks, and you can break up blogs into pages or use labels/tags as well. Organize before you start writing; trust me, it is easier this way! I didn’t do this with my early versions and I found them difficult to work with in the end. Some people organize their books by project. 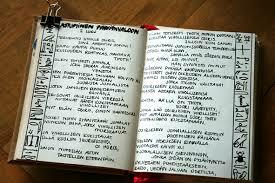 Others use their commonplace books as devotional work, research records, or work toward a book. My current commonplace book is a Miquelrius notebook with a soft leather cover. At the moment it is rather similar to a day planner, with calendars added in by me and notes on weekly activities. However, it is much more than that. I have made note of sites that I’ve found helpful over approximately the last eight months (like PopClogs), as well as inspirational quotes and things that I need to remember. I’ve noted my daughter’s height and weight changes between visits to her doctor, which has shown that she is steadily growing, not too fast and not too slow. I’ve included lists of books that I’ve checked out and enjoyed, books that I want to buy eventually, and books that others have recommended to me. All in all, it is a convenient bundle of information, readily accessible anytime it is needed.